Two weeks ago, I took a trip to Westfield Shopping Centre in Stratford. The purpose was twofold. To start (and finish!) my clothes shopping for the impending summer holiday (the focus of a future blog), and to expose my daughter, who is 10, to the delights of The Real Greek restaurant as part of her Ancient Greece project for this term. We are still struggling to link the photographs she took of plates on the wall and souvlaki on her plate with Ancient Greece, but I am sure we will get there! The food, by the way, was delicious. As we drove into Westfield passing the Olympic Stadium, the Copper Box, Aqua Centre and Velodrome it couldn’t help but bring back memories of that glorious late summer in 2012 when the Paralympics took centre stage. Jonny Peacock and Ellie Simmons (who I saw walking through Westfield) became household names. My abiding memory was listening to people talking about the excitement of the competition that ignited the interest, not the Paralympics per se. In the six intervening years there hasn’t quite been the level of take off I was expecting, but then I am a very impatient person and think everything should have been completed yesterday. But it had, and has, made an impact. 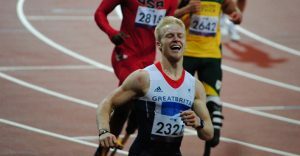 When the history of disability in the twenty first century is written the Paralympics 2012 will loom large. 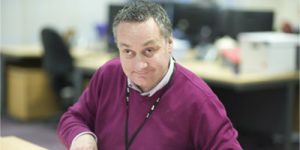 And so will Lost Voice Guy, the focus of my blog last week (and judging by your response the most popular I have written – thank you). So, it brings me onto the issue of the disability pay gap, and the recent TUC report which showed disabled workers in the UK earn £1.50 less than their peers for every hour worked. This means a 15% disability pay gap now exists and is at the highest level since the Government began publishing comparable data in 2012 (back to the Paralympics!). In some ways (and please don’t take this the wrong way!) I am pleased. Pleased that we are having the debate and such a report exists. Two years ago, when Purple launched, the disability employment arguments focussed on the gap between disabled and non-disabled people and the fact the dial had not really shifted in the last 25 years despite disability legislation, regulation and cultural development. For completeness, the gap was about 33% which is now down to about 31%, and a key indicator of inequality. Not for this blog but there is an array of other metrics from education, poverty and wellbeing that paint a similar story. So to shine a light on pay itself is progress and needs to be addressed in parallel to reducing the employment gap and increasing the quality of opportunities in getting into employment and then career development once in employment. In 2016 Purple’s research showed 45 % of hiring managers were concerned if they employed a disabled person they wouldn’t be able to do the job. That 45% needs to be 0% or at least a non-material figure. The gender pay gap is a complete mystery to me and is one of those pernicious issues from our history that needs to be corrected – and now. It is a pity that, in 2018, companies employing over 250 people have to publish their figures, but if this is the catalyst to accelerate action then so be it. If the same is needed to address the emerging disability pay gap, then so be it. So back to Lost Voice Guy. Should his agent charge a lower fee because he has a disability. Should Purple reduce the consultancy charge for me (which is highly reasonable by the way!) because I have a disability. Nonsense. Of course not. I would urge 250+ companies to maintain the momentum around the gender pay gap and publish figures around disability. This will immediately expose the issue of under-reporting of the figures and the link with hidden impairments. We know in most companies there is a high degree of non-disclosure, particularly around mental health, which is never going to be reduced if people fear being paid less if they do. It is actually in companies’ interest to publish and show actions as the way of increasing disclosure, offering the right reasonable adjustments, and increasing productivity. For smaller companies it also makes sense even if you are not legally obliged to publish figures. We are making progress. Alongside people like Jonny Peacock, Lost Voice Guy and the millions of disabled people up and down the UK you can do your bit to address existing inequality and prevent a different kind of inequality emerging.